Publisher: New York University Press, 1948. Hard Cover, 451 pages, 6.25 x 9.25. 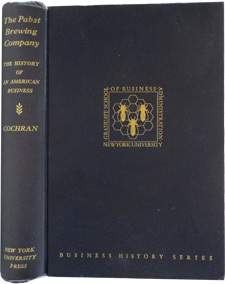 Here is a 1948 first edition copy of The Pabst Brewing Company: History of an American Business. 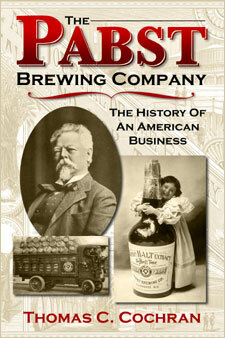 Written by noted business historian Thomas C. Cochran, the book is a landmark study in brewing history. 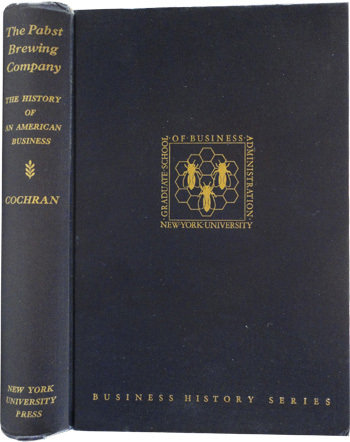 Although the focus is, of course, on Pabst, Cochran's incredible depth of research paints a picture which goes well beyond just the Pabst story. It really is a cornerstone work, offering unmatched insight into the ups and downs of a major brewer over the course of a hundred years. There is simply no other examination of a single American brewer which is more comprehensive, and which offers so much insight into the evolution of the beer business in this country. A true classic, and increasingly difficult to find as historians are discovering the the book's invaluable insight.